The extra-strength profiles used to construct the gables and ridge pole make the Premium series the strongest greenhouse money can buy! 10 MM Polycarbonate - 5/8’’ THICK. Now available with either the aluminum finish or the green finish. This extra thick polycarbonate provides additional protection from the cooler temperatures and elements. Features like one of the strongest frames available, extra overall height, thicker 10mm polycarbonate covering, heavy-duty hinged door, and rainwater downpipes make these greenhouses stand out from the rest. 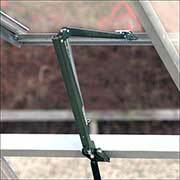 Premium greenhouses also include a gasket locking system to secure the polycarbonate to the frame. You simply place the gaskets into the frame of your greenhouse, slide in the panels, and your greenhouse is ready to go. 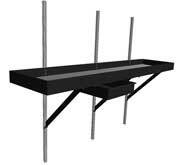 This improvement reduces installation time and makes the greenhouse easy to take down. The Premium Plus Greenhouse is a 9' 8" x 12' or 9' 8" x 14' 4" hobby greenhouse that is great for those who want plenty of growing room but don't want to compromise on looks. The 9' 7" peak provides excellent headroom while the aluminum frame with black accents and decorative cresting make for an attractive, but sturdy greenhouse. 10 mm twinwall polycarbonate is the most economical glazing materials. It is a practical for a `growing greenhouse` as it offers 50% more insulation than single pane glass and diffuses harmful sunlight in the summer. It is essentially unbreakable, making it very safe in a family environment. The insulation will prevent the temperature in the greenhouse from changing drastically and results in the best possible growing environment. *****Call us 1-800-531-4769 (toll free). Panels enclosed within greenhouse framework. Gutters and end caps included. All mounting hardware and assembly instructions included. 20-year warranty on frame, 5-year warranty on covering. Juliana Aluminum Shelving The 2-Section Aluminum Shelving Kit spans two sections of any Juliana greenhouse and is 20" D x 55.7" L.
The Juliana Ventomax Opener is an automatic, solar-powered greenhouse vent that requires no electrical installation. Instead, the vent features a black cylinder that is filled with vegetable oil. When the sun heats the cylinder, the oil expands, causing the vent to open. The vent can be opened a maximum of 18", and can be set to close when the temperature drops anywhere below 77 to 61° F.
The Juliana Ventomax Opener This optional Cresting for Juliana Greenhouses add a unique, classic look to any greenhouse structure. The plastic cresting is installed by fitting it into the ridge bar, and apart from the additional aesthetic value, also works to deter birds from perching on the greenhouse roof.